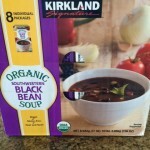 New Vegan Costco Products: Vegan Southwestern Black Bean Soup and Mamma Chia Blackberry Drink! VEGAN, GLUTEN-FREE & ORGANIC from COSTCO! I love when my husband goes to Costco to buy things like toilet paper and mushrooms and to my surprise and delight, comes home with a new delicious-looking vegan Costco product for me to test!! During his most recent trip to Costco, he brought home not one, but two interesting vegan items that I just couldn’t wait to try! 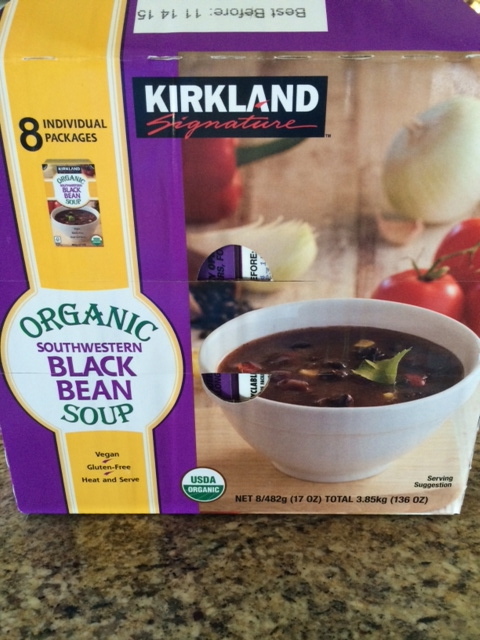 As typical of Costco items, when you crack open the big carton of Kirkland Organic Southwestern Black Bean Soup, you’ll see that inside, it has spawned 8 individual boxes of 17 ounces each. One small box says it serves 2, which I would tend to agree with, but those with hungry appetites or looking for a whole meal in a bowl may slurp up a whole boxful. The container proclaims that it is vegan, gluten-free and organic which is absolutely wonderful but, as we know, this proclamation in itself does not necessarily guarantee good nutrition. After studying the side panel of the box where the truth is all there in black and white, this products does looks great on paper: for 2 servings it has 150 calories, zero fat, 8 grams of fiber, 7 grams of protein, 6% Vitamin A, 6% Calcium and 6% Iron. The ingredients are very similar to what I’d put in there myself. The only item to give me pause was the 590 mg of sodium or 25% of your daily intake for the 2 servings. I do know that my homemade soup does need some added salt to enhance the flavors and since this does not claim to “low sodium,” I’m okay with it. Now, for the other very important component—taste! I’m happy to report that this soup was tasty and delicious! 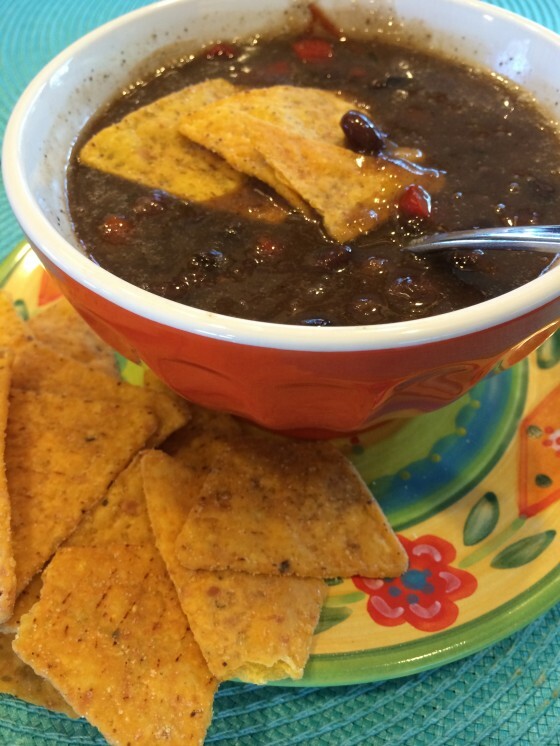 I loved the abundance of black beans, corn and tomato throughout the the soup, making it chunky and hearty. I am not a big fan of caliente-spicy-hot like so many people are and this soup was pleasingly flavored without being very spicy. Those that like really spicy can always add some hot sauce or salsa to it and raise the heat! This is a filling, low calorie, high fiber, no fat, healthy vegan lunch, appetizer or snack anytime! I would put a dollop of guacamole on top to finish it off. 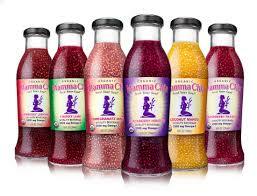 If you have never experienced a chia beverage, get ready for a very unique sensation! 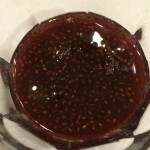 I’ve been diligently adding chia into my diet lately—sprinkling chia seeds on my oatmeal, adding them to smoothies and creating Chia Pudding, but I definitely was not prepared for the sensation of drinking a liquid with gelatinous chia seeds flowing through and through. 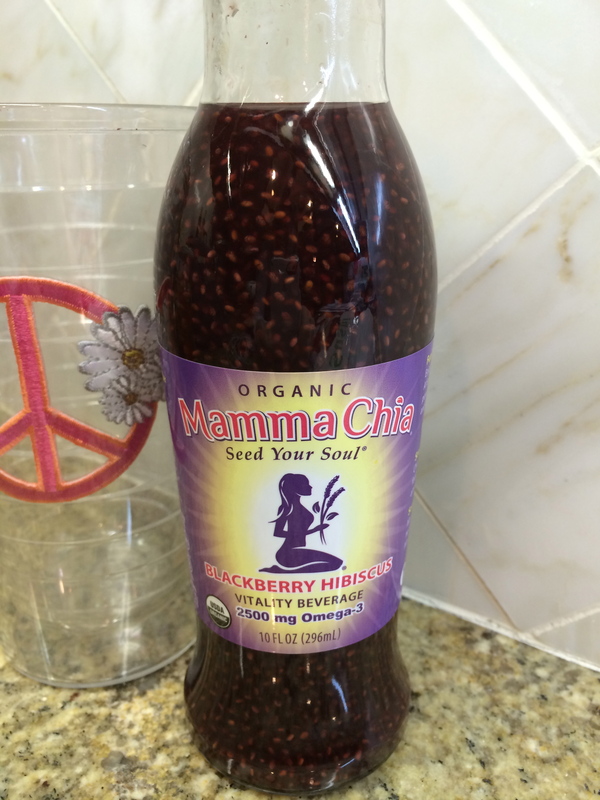 But first, the nutrients that abound in 1 serving of a 10 ounce bottle of Mamma Chia must be itemized: 120 calories, 2500 mg of Omega-3, 965 mg of Omega-6, 365 mg of Omega-9 (which account for the 4 grams of fat), 6 grams of fiber, 14 grams of sugars, 4 grams of protein. In terms of vitamins: Calcium 10%, Potassium 4%, Magnesium 15% and Iron 7%. Gluten-free, vegan and lightly sweetened with agave, blackberry juice concentrate and hibiscus extract and other fruit and vegetable flavors. The sensation of soft little jello balls is the only way to describe this wonderful drink. It may be completely weird for some but I think it’s a taste worth cultivating! The flavor of blackberry and hibiscus is light with the perfect amount of mild sweetness. The thickness of this beverage makes it very filling and one bottle might even provide you with 2 servings. They come as a six-pack and I find myself reaching for a cold Mamma Chia every day, as it is very refreshing and satisfying for thirst as well as a snack. 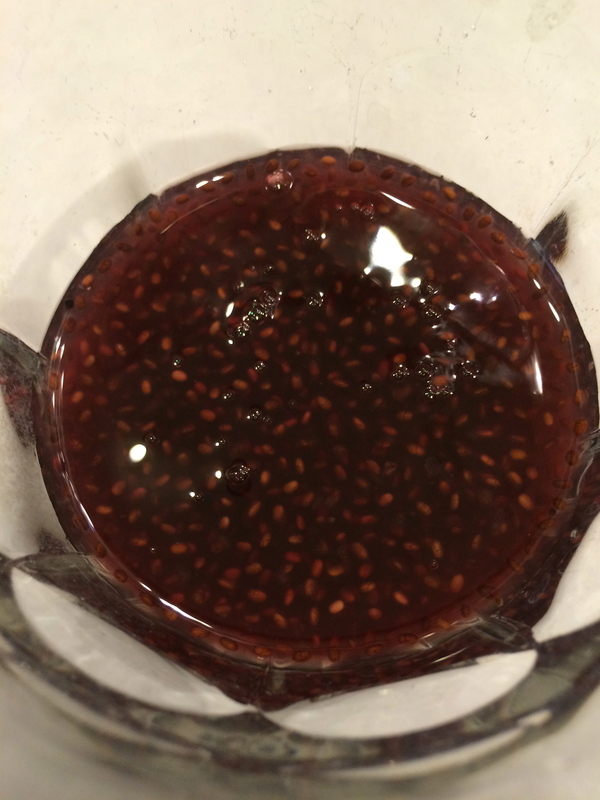 Chia seeds are so very healthy so this is one drink that I will feel no guilt about enjoying it! 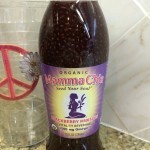 After checking out the Mamma Chia Website I learned that they offer 8 additional flavors in bottles like Cranberry Lemonade and Coconut Mango and 4 in squeeze packs. I’m definitely going to be on the search to try some of these out! Hi, surfing around and found your entry from earlier in 2014, I too pick-ed up 2 cases earlier in the year and found it delightful and a great balancing act for my hypoglycemia. I have been back to Costco in person and electronically with no success any idea where I might get this products going forward? Maybe try contacting Costco customer service to re-stock the soup. No? I’ll bet you can contact the company online, and ask them where you can purchase their soup. Or maybe, contact customer service at Costco and ask them to carry the soups again. I bought it at Costco yesterday, so perhaps it’s back for the fall?